A component of ancient Ayurvedic medicine, curcumin extract inhibits inflammatory factors in the body. It also helps support digestive function, supports immune system health, and more. In addition, some studies indicate that curcumin can help maintain normal, healthy platelet function. 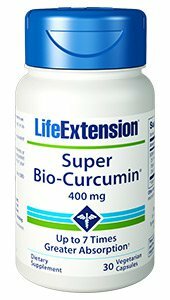 No whole-body health regimen would be complete without curcumin, Life Extension® has created Super Bio-Curcumin® using an ultra-potent extract called BCM-95® Bio-Curcumin® – which is actually up to seven times more absorb able than conventional extracts. Plus, BCM-95® Bio-Curcumin® also remains in the bloodstream almost twice as long as standard curcumin supplements. Curcumin promotes your body’s healthy response to inflammation by inhibiting key inflammatory factors such as NF-kappaB, a protein molecule that acts like an “on-switch” in genes that govern the body’s pro-inflammatory responses. Curcumin has been shown to exert powerful inhibitory effects on NF-kappaB activation. Curcumin also inhibits the metabolism of arachidonic acid, as well as the activities of cyclooxygenase, lipoxygenase, and cytokines (interleukin’s and tumour necrosis factors). Other clinical trials suggest that curcumin can promote healthy bowel function and joint health. Curcumin extract promotes immune system health by inhibiting histamine release from mast cells. Curcumin can also benefit your mind: In some studies, curcumin supported healthy brain function and offered neuro-protective benefits. Curcumin supports pancreatic function by encouraging pancreatic islet health. Curcumin’s multifaceted benefits even include antioxidant protection and hormone balance support. Research indicates curcumin can help protect against estrogen-mimicking chemicals, help protect against free radicals, and promote normal cell cycle growth.